In the recent times we have grown used to Bollywood actress always making peppy and fantastico appearances. Bollywood actors are icons and inspiration for fashion and makeup looks too. Everything these celebrities do has an impact on their fans. Whatever they do influences us in one or the other way and we look up to them and try copying their fashion, their make up and their hair styles. But there are some instances when these same celebrities totally disappoint you. I personally just ignore any malfunctions by celebrities because hey they are human too! But these makeup looks are just too prominent and too ghostly to be ignored! Plus, these looks were sported by actress on big events and occasions, which has brought them more into the limelight! Let's have a quick look into the worst makeup looks by Bollywood celebrities. These looks can help you avoid such mistakes and you can come out looking more peppy than your favourite celebs, because hey isn't it better to learn from mistakes of others? How to turn this look into a peppy one: If you end up looking all oily in the middle of an event like Priyanka in this photo, use blotting sheets to blot out the excess oil and touch up with powder compact to look fresh and fantastico again. OMG! I can't sleep in the night now. Gauri dear has scared the goods out of me! Producer and Star wife, Gauri Khan is quite infamous for her makeup choices. She is one celeb who totally needs to get a new makeup artist. Not just this picture but in many of her recent appearances she looks oily with her cakey makeup and so uncool. Such a pretty face, sad that she chooses to make it go so wrong. That lipstick is killing me too. >_< Gauri needs to learn to use blotting paper to remove excess oil from her face. How to turn this look into a peppy one: Gauri is one celeb who needs to embrace blotting sheets asap! Also such cool toned punk lipsticks should be totally avoided by women with warm or dusky complexion. An oil free face with a dusty brown or a earthy coral lip and this look can be a total different story. How to turn this look into a peppy one: Use the right shade of foundation. One shade light or one shade dark is'disaster in the making'. She is always the cute one, giving you bubbly appearances but this time she just went quite overboard. Looks like she stepped into an oil painting competition and got herself painted purple-pink. How can people step out of home like this? Howww!! Ameesha please use a mirror before stepping out. How to turn this look into a peppy one: It is always good to avoid too much shimmer on your face. If your blush has micro shimmer then go for matte eye shadow or you will end up reflecting light. Also blend your make up or don't apply at all. Here the blush and the eye shadow haven't been blended well. *Speechless* :O That stark contrast between her skin shade on neck and face is epic fail. How to turn this look into a peppy one: Again, your foundation should match your natural skin tone. Also you need to apply foundation even on your neck area not just face! Our fashion queen Sona always looks shona but this time, she just forgot to look in the mirror. The concealer hasn't been blended well. Looks like she took a blush and highlighter bath in the second pic. Bad makeup days for her, wish she put same effort into her make like she does with fashion. How to turn this look into a peppy one: Under eye make up needs extra care when you have peppy eyes or dark circles. This look would have worked if Sonam had blended her concealer well. 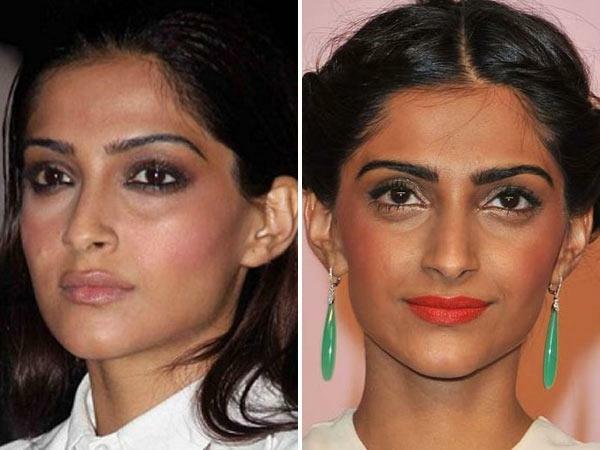 In the second pick Sonam should have avoided such a deep blush with a bright lipstick. She is always pepped up and gorgeous but this look was just a total miss. That lipstick is starkly contrasting with her shade of foundation which is making her look so dull. Another celebrity having a bad make up day. How to turn this look into a peppy one: Deepika is wearing foundation at least 2 shades darker here. A foundation shade matching her skin tone would go well with that lip colour. In these worst makeup only Deepika is looking better than others. Gauri and Sonam are looking like jokers.